[i] Anderson, et al v. North Carolina State Board of Elections, “Petition for Judicial Review,” 14 CVS 012648, September 19, 2014. Note on (2) above: pursuant to a letter from Executive Director of the SBOE Kim Strach to all county boards of elections, suggesting that they consider input from municipalities before setting Early Voting plans for municipal elections, Stella Anderson wrote a letter to the four Watauga County towns (Chair Luke Eggers refused to write the letter). Both Blowing Rock and Boone requested satellite Early Voting sites, but when Anderson presented that request to the full Board of Elections, Eggers and Bill Aceto refused to honor the requests. 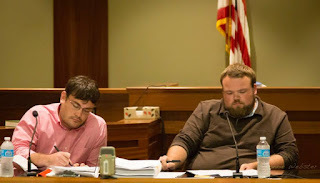 Note on (5) above: The Eggers/Aceto plan will slash Early Voting availability from 113 hours over a period of 2 ½ weeks in the 2013 municipal elections to a total of just 68 hours for 10 days this year, if the SBOE allows it to go forward. Note on (7) above: "Unconstitutional" ... that's exactly the word used by Senior Wake County Superior Court Judge Donald W. Stephens last year, when he ordered the SBOE and the Watauga Board of Elections to restore an Early Voting site in the ASU Student Union. That ruling hasn't been overturned.